The Golden State Warriors may have squandered a 3-1 finals lead against Cleveland last season but Steve Kerr’s men are still one of the hottest teams in the NBA. GSW recruited former MVP Kevin Durant in the off-season to add to an already stellar line-up and questions are being asked as to whether or not their attack is the best the league has ever seen. Durant alongside back-to-back MVP Steph Curry and Klay Thompson – he of the 60-point game last week – is some proposition and recent for lines of 106, 115, 106, 109, 127, 100, 102 and 109 show that Kerr’s offence is running very well. However, at the other end of the court, the Warriors are not so tight. Deficiencies shown up by the Cavs in that finals series are being exploited and, by losing Andrew Bogut and Harrison Barnes to make way for Durant, their defence has taken a hit. As a result, while they continue to score at will they are also leaking points at the other end as last week’s epic 133-127 overtime loss to Houston showed. Take over 209.5 points in what will likely be a high-scoring encounter. The season is a quarter of the way through and we now know who is doing what. 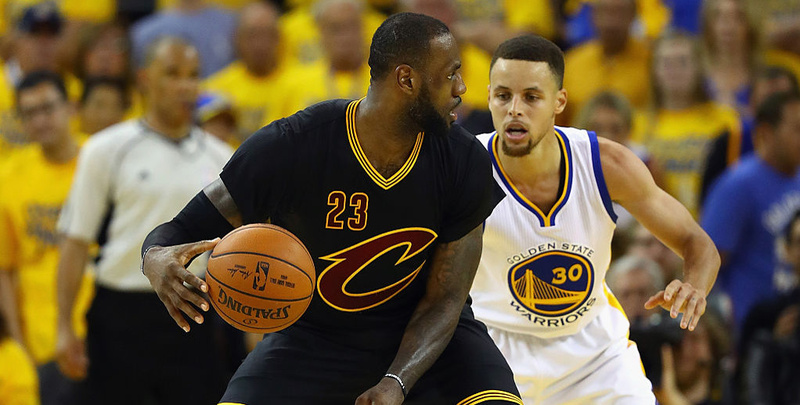 LeBron James is a four-time MVP but has made way for Curry in the last two seasons and it is widely acknowledged that this year, having dethroned Curry in the finals, he wants his title back. He is currently best priced at 9/2 which, considering the momentum behind him getting the award is strong, represents excellent value. Ahead of him in the market are Houston point machine James Harden (3/1) and Oklahoma City’s one-man wrecking ball Russell Westbrook (5/4). Westbrook is on a staggering run of seven successive triple-doubles, tying the great Michael Jordan, and is covering the loss of Durant admirably. However, both his and Harden’s MVP chances could be hindered by their sides not lasting the pace. With James, the Cavs are everyone’s tip to sweep the board in the Eastern Conference and this season has come so easy to him that he was able to take on the water bottle challenge during a spell on the sidelines in the recent win over the New York Knicks. Curry, somewhat down on recent years, is 13/1 to make it a three-peat.